UFA, players qualified by Isles & Bridgeport. Sound Tigers President Howard Saffan's comments on Bridgeport being very active Wednesday. Scott Gordon team USA head coach, what seemed his limited role at draft (vs Nolan last June) and how he will play Tavares vs Okposo last season with a few words on Mr Botta-Mr Logan's interview with head coach. Also why no Laviolette at this time given he coached previous club and with summer camp invites could DiPietro's first work be at this camp and will Wang-Snow-Gordon want him to participate? More on Line combinations, enforcers needed. Bill Guerin's new contract. Monday's LH events with Charles Schumer's support and misconceptions about the Islanders being automatically a poor team while not mentioning injuries in media articles as to why club finished 30th. NYIFC changes for Free agency, rosters updated for Islanders-Tigers and draft page moved to prospect blog. One more written entry, a final wrap of the draft with some articles I found that would not work on an audio entry. Russian Prospects.com: has a profile of Islanders 4th round selection Anton Klementyev who there has been very little information on. GopherHole.com: Has an interview with Andres Lee from November of 2008 where he will attend Notre Dame eventually (for 09-10 will be in USHL with Green Bay Gamblers) but his sport has yet to be determined between football and hockey, Lee is the Islanders 152nd pick in the 2009 Draft. OHL.com: Has Casey Cizikas profile but Sportsnet.ca has a full interview with the Islanders fourth round selection from January where he came off a first half where he struggled. It should be noted according to Mr Fornabaio back in April in a Ct Post entrythe Islanders-Sound Tigers had the following players who had to be qualified, some like Colliton went to Europe. GROUP II (restricted, pending qualifying offer) -- Jeremy Colliton (V-320), Blake Comeau, Jamie Fraser, Jack Hillen, Nathan Lawson, Peter Mannino, Jason Pitton, Trevor Smith by this time which we have nothing official about from the team or the media. It should be noted in our 3/5/09 articles Nate Lawson discussed the new contract he signed with the Islanders at the trade deadline here/not available and here which still is that replaced his AHL contract signed last summer. Lawson at the time was leading the AHL in save percentage (.938) and second in goals-against average (1.81). How can someone be a group II free agent on an April list who was resigned in March? So far Newsday or the Ct Post has had nothing on who Garth Snow issued a qualifying offer to for those wondering while many newspapers covering their teams have. These are the kinds of days fans pick up a program and become draft experts, it has to be noted some teams conduct drafts even without a gm as we saw with Florida and last season with Tampa or in the past with Montreal. Garth Snow has to trust the people he hired also to balance out the clubs long-term needs. 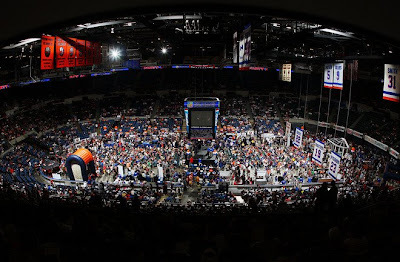 Over the years many New York Islander fans (myself included) have placed so much importance in the general manager's role with regard to the draft (and everything regarding a team) we all forget this comes down to the scouts and in this case assistant gm Ryan Jankowski and the people on the staff world-wide. They have meetings make a draft board of their own and decide who they want and when they can get that player. In many cases I have read the gm has less impact than the head scout. General managers do not live on the road in Europe during the NHL season visiting prospects, they send reps to scout games and sometimes interview players. The gm usually is checking in on his picks already selected, along with going to the WJC and working with his NHL team. Which lead us to this weekend. For years we read the New York Islanders had to get some prospects to backup Rick DiPietro. 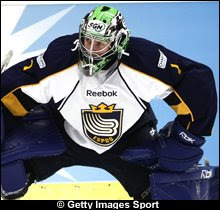 They had Stefan Ridderwall, Kevin Poulin and Jase Weslosky along with Peter Mannino and Nate Lawson in Bridgeport but apparently this was the day Ryan Jankowski and the scouts decided to get serious with their two selections who ranked in the top five for European goaltenders. Was it the right move not to add more size at forward/center/defense? More than a fair question considering these were not franchise prospects and a player like Ferraro was grabbed immediately along with some other first rounders who dropped but the Isles have neglected the goaltending for a long time in terms of top level players, this was a weak goaltending draft. You also have to look at last summer's draft where they had so many picks and so many propsects under contract Max Gratchev could not be signed. Do I absolutely think that means DiPietro cannot play? Absolutely not but it does mean they wanted some serious potential backups in their system. I'm sure on paper no one among fans is doing cartwheels but on day one they got the player they had to get. Is deHaan the right pick and did the Isles overpay in picks to trade for him? There are indications he could be and they did but that remains to be seen for years. Would he have lasted to 26th or even 16th? Obviously Jankowski did not think so. Not much else today if anything and it will take years on some of these other players but Isles did not get bigger or tougher in a draft they had a lot of picks to address some holes. Isles constant trading did not help the crawl as they got back some picks they had earlier but I think we got it right in the end. Sidebar has draft section and Prospect Blog Page has full 2009 Draft section already. Please wake up out there, Pittsburgh won a league-wide lottery after a lockout for a franchise player after being brutal for years (same lottery the Isles could have won just as easily) and it's fair to write without Crosby the team that was in tenth place this year (or where the Isles were last year around the trade deadline) would have missed the playoffs and have stayed on the outside to this day. Pittsburgh's so-called rebuilding also included anything but going with prospects after a ton of veterans signed post lockout (Crosby lottery) who fell on their faces with LeClaire, Recchi, Palffy and Mario Lemieux among others. Imagine the reaction if Snow signed two or three Mike Knuble's next week to go with Doug Weight? Whatever the Isles do unless they sign a ton of veterans, it will be nothing like how Pittsburgh got where they are which included 1/3 of their forwards in game seven as former New York Islanders. That mostly does it for the written blogs again, whatever happens from here (if anything) we will go back to audio format. NHL.com Profile of second ranked European goaltender. Elite Prospects profile & Hockey Forecaster review. Ferraro was selected immediately afterward. What would you have me say in an audio blog entry that would only take a little more time to write. I'm very happy for all New York Islander Fans who all deserve a night to enjoy this, they selected the player best suited to their needs which is a scorer who is considered a franchise talent and someone that has been hyped for years. Garth Snow did Bill Torrey proud and the gm impressed me with his poker face and in the end had many guessing wrong, less was not only more but most in this case. A little surprised at all the trades by Snow-Jankowski and staff to maneuver into position to take a player projected to go somewhere in the twenties and I think I have the crawl correct for Saturday. The Isles preview had Calvin de Haan with picks 30-60. Zack Kassian is a right wing for a spot the Isles badly need a prospect or two on that side. Mike Iggulden is not that player given how he has moved around, unless something gives in UFA Robin Figren or someone else may have to be. Having written that de Haan is this teams highest drafted defender selected since Eric Brewer and the only first rounder since that draft. Obviously his connection to Tavares combined with his offensive ability helped in the choice. Add de Haan to a group that includes Katic, Kohn, Ness, Niemi and Jack Hillen among others remembering for now the Isles have six defenders under contract (not counting Hillen RFA) for next season already who were only healthy for about two or three days as a group. It starts up again Saturday with the Isles having the first shot at Ferraro among a few first rounders who were not taken. New York will have picks 31, 56 late in the second round, No. 91 at the end of the third round along with selections 122 & 152. You can see the trades coming after Philadelphia paid a huge price for Pronger with Bouwmeester available starting 7/1 or his rights traded before and I absolutely see the same things at work that got McCabe traded to Florida here with Kaberle unless Boston gets to work quickly with Kessel. Will some team be able to polish up Dany Heatley's image which Newsday never attempted to do for Yashin if they pay his bonus now? If I'm Garth Snow I'm offering Sutton or Witt to offset the bonus but it's obvious the Sens are going to want some young talent and I'm guessing a lot more than some combination of Tambellini or Blake Comeau-Frans Nielsen. I don't buy Murray for a second saying he'll play Heatley if he cannot trade him for what he wants. I don't expect an answer tomorrow in the draft for this but anyone else find it frightening Tim Jackman or Joel Rechlicz is the enforcer to protect Tavares who will not be on his line? Will be out from 12pm to about 2pm so I will have third round early and will come back and fill in blanks later. Feeders have all the relevant information and then there is Newsday who did a very poor job claiming through Colorado Snow was taking Duchense before changing the headline or Arthur Staple reminding us Tavares is not even as good as Stamkos which is a joke for someone who broke Gretzky's scoring record making such an outlandish claim. Can Newsday go pay-subscription fast enough after yesterday? ITV did a fantastic job and had everything from Tavares, to Wang to Gordon. Peter Botte was left home for the Ranger centric writer at the Daily News. The Post had Larry Brooks cover the Isles in Montreal while Mark Everson covered the Devils, Dan Martin was at the Coliseum. Messier's biographer covered the Islanders-Rangers and Devils in Montreal for the Times. Finally for a blog that at best has been in experimental mode long after it's post closing date with some audio entries that has been lingering around at best it was very nice to see such a huge turnout here so thank you. Our poll results had a combination of 38 votes not blaming Snow if Tavares were a draft bust. ITV went all out with interviews from basically everyone involved. 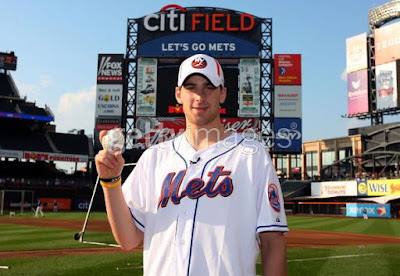 The New York Islanders Friday Night Selected John Tavares with the First Overall Pick in the 2009 NHL Draft. Topics: Decision day, more articles/rumors. NYIFC plans for draft. Note-There may be a second update later in the day or after the Isles select. Newsday playing on Isles fans fears regarding draft but not Knicks who drafted Thursday and usual journalism double-standards that influence Isles media perception across North America and hurt teams ticket sales/exposure. Steve Zipay in Montreal, is Greg Logan who finally got comments today from Tavares, Hedman, Duchene also in attendance? Speculation from Espn Pierre LeBrun, Jim Kelley of SI would respect Snow if he selects Hedman. Trottier upcoming camp, Isles draft blog opened with Ryan Jankowski-Steve Mears comments. Lot's of articles speculating on Isles pick in all directions. 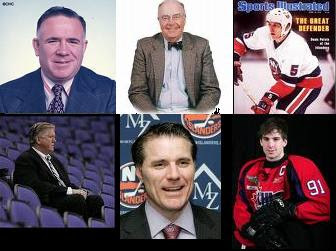 Note-Mr Logan has had draft speculation of his own and had general manager Garth Snow's comments in several blog interviews/articles this June which I did not include in tonight's audio update but to be fair wanted to add here. "Before the 1973 draft, (Canadiens G.M.) Sam Pollock took me outside the Forum and around the block trying to convince me to trade him the first pick," says Bill Torrey, remembering his days as Islanders G.M. "It was almost like he thought I'd get a vision of Bill Durnan or Howie Morenz telling me to trade Denis Potvin to the Canadiens. And maybe I did hear them. "But his argument--their argument--wasn't powerful enough to convince me not to take Denis Potvin for the Islanders." Islanders in UFA and the opening/cap space that was Bill Guerin's spot along with current depth chart & right wings, Dany Heatley-Marian Gaborik or what management could do to make up for veteran scoring lost. 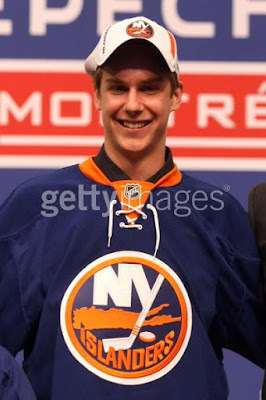 Prospect who had lunch with Isles this season from Soo Greyhounds. Minnesota goaltender who Snow could be interested in as backup with starter ability in Josh Harding. BOG meeting, Canadian media spin on Tampa ownership circumstances and Vincent LeCavalier's soon to be long-term contract on the books. Tsn article comparing Daigle-Pronger draft to this one and other past selections. NYIFC Poll update and new page peel to prospects blog in the right hand corner. Media Game, Mike Brophy/Sportsnet. Mr Logan vs Mr Botta's content. Brent Sutter, Kurtis McLean, Jon Sim. 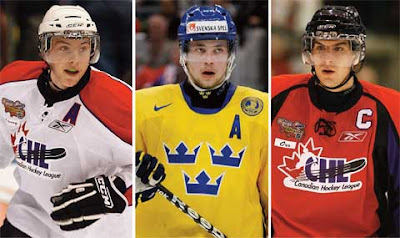 NHL Draft Tavares, Hedman, Duchene. Outdoor game Philadelphia at Boston. Correction-Robert Esche will play in the KHL again next season. NYIFC Poll: If Taveres is a draft bust for Snow does the gm deserve the blame? Basically a worthless day so far on the professional media front regarding the draft or the Islanders (unless you are into the Canadian media getting Burke and Milbury to speak) so why not a one-time written poll entry? No, I'm not going to let anyone get off easy here. 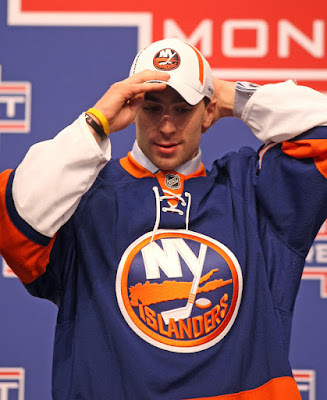 The majority seem to want John Tavares and most of the professional prospect sites have Tavares as the top overall prospect so let's put in out there that John Tavares will be a bust as a draft pick after he is taken by the New York Islanders on Friday. Are you going to blame Garth Snow, Ryan Jankowski and the scouts if they make what many feel is the conventional pick in Tavares? How many articles have you seen over the years blaming Bill Torrey for making a similar conventional pick in Dave Chyzkowski from 1989 who was second overall and is widely considered a draft bust. If Snow does go with Tavares and he is a bust will you be willing to say he did what I would have done and give him the benefit of the doubt Bill Torrey received? Myself? I would absolutely give Snow and staff the benefit of the doubt if Tavares is the Isles pick Friday and he becomes a bust in the end just as Bill Torrey received the benefit of the doubt. NHL draft speculation picking up. Is Dean Chynoweth Scott Gordon's choice or Garth Snow's, where's the head coaches comments on his new assistant who was a gm/coach? Brent Sutter to Calgary, Jeremy Colliton to Rogle, Kenny Jonsson's retirement and impact in his New York Islander career. Show me time for Snow-Janknowski's staff with the later round impact players vs Milbury-Feltrin later round picks. Take the best available or the best for your teams needs. Tavares reports of lack of speed & defense on a club that drafted Bailey and Okposo who are not dynamic skaters. Garth Snow, Rick DiPietro, UFA goaltenders, Andy Hilbert, Jon Sim, NHL Draft, Trades, Pat Brisson, Steve Simmons 3/15 article, Point Blank, Chris Botta, John Tavares, Todd Richards, Minnesota Wild, Peter Laviolette, Ted Nolan, Finals, Sidney Crosby/Handshake, NHL Finals, Bob Lawrence. Topics: Finals, Bill Guerin, Pens free agents, FA Goaltenders-Flyer goaltenders Emery-Esche, Islanders Draft, Lighthouse schedule this week, Post article with Wang's comments.